Hello Brigit, I sent you a note in a comment, early this morning. I don't know if it went through. I'd like to hear from you. I think your a fellow Christian. We both tat. And I read a bit, as I'm so hard to please in the reading dept.The book I want to start next if Phil Calaway's book "To Be Perfectly Honest." to both In Tatters, where my Mad Tatter and Jane's where I'm Batty Tatter. I see you haven't posted in a long time. I hope you are well and all's well around you. On your previous site you had a picture of a heart you created that you called "Romantic Heart". You invited anyone to try to figure out how to make it if they wished as you had not written up the instructions. I have made the heart many times and have recently written down my instructions. I would like your permission to post it on InTatters' member patterns page. 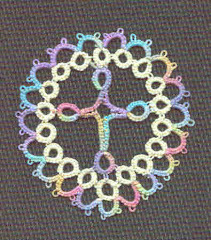 I would give you credit for the original design (in my computer it is titled "Birgit's Heart-My Directions"). It is such a pretty heart. I'd like to see it out there for other's to enjoy. I chose InTatters because I don't have my own blog. When Geocities ceased to exist, I needed to find another place to store my patterns, and this blog is it! I tat a lot less now due to wrist problems, and when I do, it's usually something quick and easy. But I still enjoy it. I love looking at other people's huge projects, but my own tatting generally runs to Christmas ornaments, bookmarks, or bits of jewelry.